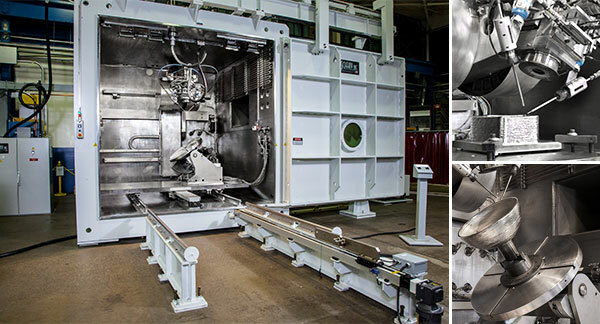 Sciaky launched its groundbreaking Electron Beam Additive Manufacturing (EBAM) technology process in 2009 with the objective to save manufacturers time and money on the production of critical, large metal parts and prototypes. Today, Sciaky’s EBAM technology process remains the only large-scale, fully-programmable means of achieving near-net shape parts from virtually any metal, including refractory metals like titanium and tantalum. What is Sciaky's definition of large-scale parts? Sciaky’s EBAM technology can produce high quality, large-scale metal structures, up to 19’ in length, made of titanium-titanium, tantalum, and nickel-based alloys in a matter of days, with very little material waste. While 3D printing large, high-value metal parts is Sciaky’s specialty, the EBAM process is equally effective for 3D printing small metal parts (with features as fine as 1mm). Is Sciaky's EBAM technology available as a part prototype manufacturing service? Yes. Sciaky can manufacture your prototypes and production parts using its groundbreaking EBAM process to save you significant time and money. All you have to do is share your CAD file and project and material requirements. Our EBAM experts will work with you every step of the way. Can I buy a Sciaky EBAM system to produce parts and prototypes in my own facility? Yes. Sciaky now offers EBAM systems for purchase. All Sciaky EBAM systems are customized to meet your specific requirements. Sciaky also provides in-depth training and support so that your staff can become EBAM experts, too. Below is an example of a popular EBAM system. Below is an example of Sciaky’s EBAM 110 System.